The Great Rivers Greenway District is developing a network of greenways, parks and trails, known as the River Ring which encircles the entire St. Louis region. 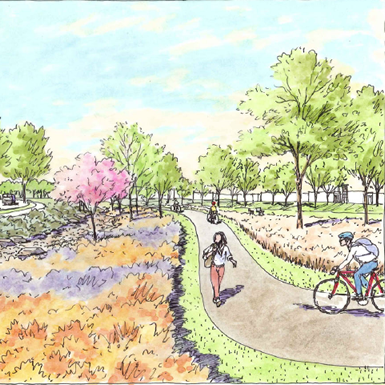 As part of the greenway development effort, Great Rivers Greenway commissioned a team, consisting of Intuition & Logic and SWT Design, to develop a trail alignment study for the St. Peters to Cottleville connector in the Dardenne Greenway. This north-south segment connects Woodlands Sports Park in St. Peters to Legacy Park in Cottleville. 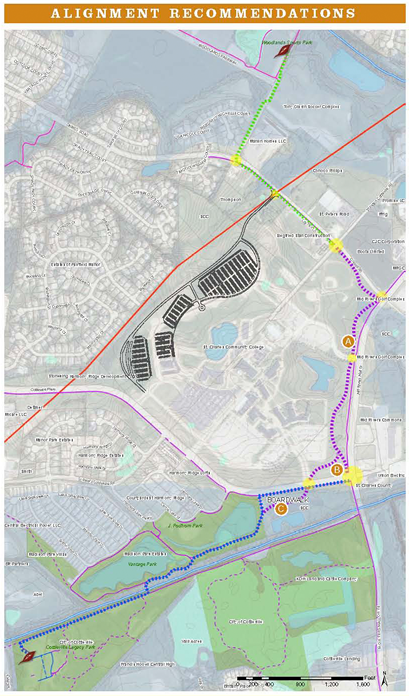 A technical advisory committee comprised of GRG, the City of Cottleville, the City of St. Peters and St. Charles Community College was formed to review recommendations of the consultant team and guided the process of prioritizing certain segments of the trail. The team analyzed dozens of connections, destinations, and alignments to determine feasibility, practicality and alignment priority. The recommended alignment consisted of three trail segments: Cottleville Segment; St. Charles Community College Segment; and St. Peters Segment. The report identified the limits and associated design recommendations for segments of trail in the floodplain and adjacent to the USACE deed restricted mitigation wetland. After the alignment study, the team proceeded to design and construction of the approved alignment.